Okay, so by now most business owners understand that Search Engine Optimisation is not only the marketing method with by far the best average return on investment, but also a vital part of doing business in this day and age. This is especially true for small, local businesses which do not have the marketing budgets of their big-business, national-footprint competitors. But how much should SEO cost you? How do you know when you are actually being ripped off? And when are you spending too little? Although this might seem like a tough question to answer, in many cases it is as simple as running a few searches on Google. Let’s use the example of the legal field. A search for “lawyer” on Google delivers over 250 million results, but a quick glance at the results shows us that the results will probably not be specific enough for the user to find what he is looking for, calling for a refined search. 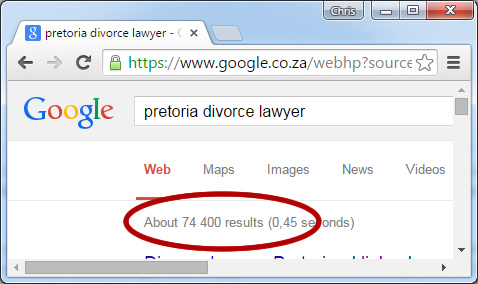 If we narrow our search to only “pretoria lawyers”, it starts looking a bit better, with only half a million competitors. But these lawyers listed might not be able to all help with a specific query, which would probably prompt the user to refine even further, to “divorce lawyer pretoria” or “labour attorney pretoria”. Interestingly, Google is also clever enough to map the results closest to you, so the location-specific keyword (“pretoria” in this case) is quickly becoming redundant… but you get the idea. In your industry, you should have a firm idea of who your main competitors are, and wherever they are ranking on Google is where you would like to be. The legal field is probably above average in terms of competitiveness, which means they would probably expect to pay a bit more for proper SEO. But by comparison, this industry still does not hold a candle to real estate, which is one of the toughest markets to compete in online. Another good way to determine local competition on Google is to go to Google Maps and zoom to a level that includes more or less the region which you supply to. Then type into the search bar the product or service your provide, and see how many red dots appear on the map, compared to “lawyers” as an above-average industry and “property” as an extremely competitive industry. When I put “property” into Google Maps, my screen looks like it got a case of measles! If your search term delivers only a handful or less results, then you should be fine with just once-off, basic SEO, at a rate of between R2,500 and R7,500. Are you looking for that number-one position on Google for a certain search term, no matter what? Expect to pay for it, and also expect to search far and wide for an SEO company that would even be interested in quoting you. Some companies might look at a goal-and-reward type of campaign, where they will aim for a top-5 position for a certain rate, and higher bonus amounts for every additional position above that. But since the advent of localized search, this strategy is becoming more and more difficult to manage. Google is also renowned for making high-impact updates to its search algorithms at a whim, which places previously-optimized websites at risk of dropping a few places. The opposite is also true, but all things considered this is a very high-risk strategy.If instead you are looking to ensure just a constant first-page ranking, and not just for a single search term but a broader spectrum of phrases, then you are more likely to find reasonable quotations for your requirements. Most good SEO campaigns focus on achieving top-ten rankings for at least three different search terms. The more terms included, the bigger the website should be, with more high-quality content on the topic, so factor this into your expectations. Did you need that first-page ranking by last week Thursday? Sorry, then SEO is not what you are looking for. Perhaps a Google Adwords campaign would work better – but be warned, this requires a constant budget, and the moment you stop paying for it is the moment you stop getting visitors, and therefore leads. SEO by comparison is a longer-term effort, but the effects also last a lot longer. It might take a bit longer to get results and rankings, but the benefit normally lasts for years for the average website. Normally, you can expect interim results within a few weeks of basic SEO, with a steady climb over the next few months. The bottom line is that the small business in a market with low or average online competition should do well with only a once-off, basic SEO campaign, and achieve around three top-ten rankings on Google within a month or two. The more competitive the market, the more likely you are to require a longer-term campaign of three to six months to achieve the required results. There are unfortunately no shortcuts in proper SEO. If you suspect the quotation you received is either too good to be true, or you might be taken for a ride, it might be better to get a second opinion from the experts. admin Uncategorized Comments Off on How much should SEO cost me? « Does my website need to have a mobile version?